These must be public, static string properties on your LocalizationType class. 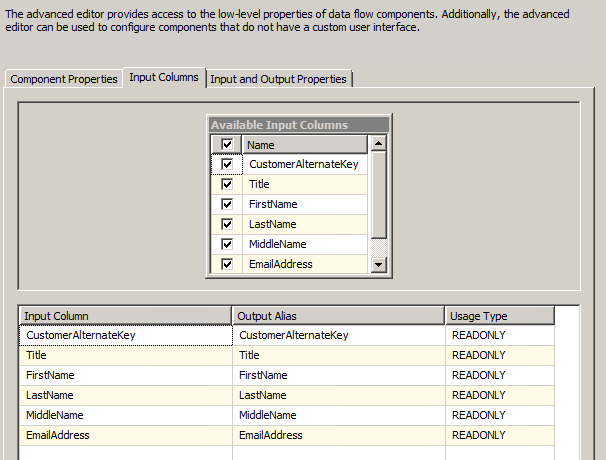 Are you loading data from an Excel workbook with external queries using SSIS? Do you want to make sure those queries are refreshed before the load takes place? Have I got the post for you! I recently had to do this myself, and after some googling with Bing, I found an MSDN forum post that describes how to refresh all of the queries within a workbook using an SSIS Script Task. I’ve adapted the code from the post, and you can find it below. For the code to compile, you’ll need to add a reference to Microsoft.Office.Interop.Excel within your script task’s project. 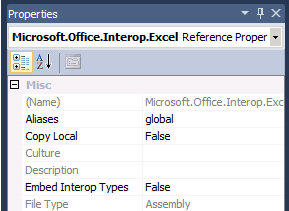 Next, select the reference under the project explorer, and open the properties window. 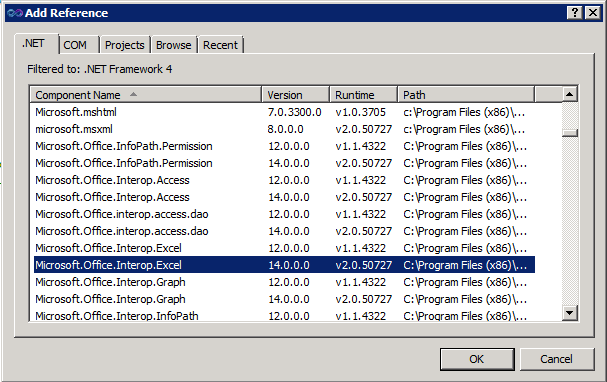 You’ll need to disable the Embed Interop Types option. (This assumes you’re using SQL 2012, which supports .NET 4 … if you are using 2008 with .NET 2/3.5, you won’t have to do this). Include the following code in your script task. It iterates over all of the Excel connection managers within your package, loads the workbook, and calls RefreshAll() to refresh each of the queries in the workbook. The task then sleeps for 20 seconds (to give time for the query refresh to complete) before exiting. When you are done, click OK to save the component. I know, you haven’t entered the script yet, but it is a good idea to save your component at this point. If for some reason I cancel out of the dialog, or you have an issue with the VSTA editor, you could lost all of the columns you just spent time defining. /// This method is called once, before rows begin to be processed in the data flow. /// You can remove this method if you don't need to do anything here. // Uncomment this line and create a package variable called "MaxRowCount"
/// This method is called after all the rows have passed through this component. /// You can delete this method if you don't need to do anything here. // will have already decrypted it for us. These must be public, static string properties on your “LocalizationType” class. Note, the Access Modifier must be set to Public. 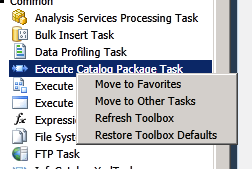 Double note (as I hit this when putting together the blog post) – in SQL 2012, when you first add a new task to your <sql>110DTSTasks directory, you can right click on the SSIS Toolbox and select Refresh Toolbox to make it show up. If your LocalizationType settings are incorrect (for example, you forgot to set the Access Modified to Public), your task will show up with an empty name. 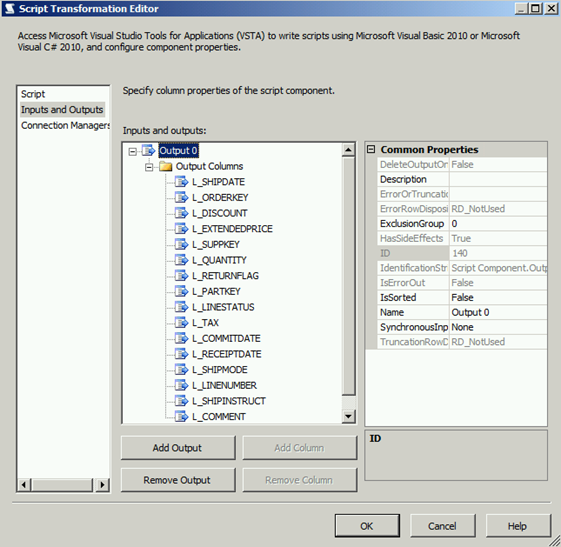 You must fix your class and rebuild, but you’ll need to restart Visual Studio before the changes take effect (as the class has been instantiated, SSIS will have the old object cached…). The following code snippet can be used in a custom data flow component to automatically select all input columns when you attach a path. This is the equivalent to clicking the Select All box in the Advanced Editor.